You’re a clone living in the not so distant future, in need of money to pay the bills and feed the kids. What do you do in order to make ends meet? Fight for your life in front of a live studio audience! Lock and load, boys. Things are about to get dicey. And though it costs a pretty hefty amount of Microsoft Points (1200 to be exact), it is well worth the investment – especially if you’re looking for change of pace from the normal run-and-gun digital fare. The game starts off with a tutorial of “Blitz,” MNC’s main mode of play. 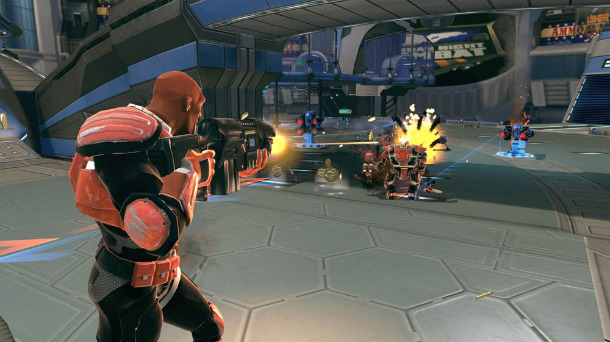 Players assume the role of an ‘Assault’ clone – an all-around soldier equipped with a basic assault rifle and grenade launcher – as he makes his Monday Night Combat debut. Along with the firearms, the Assault class of clones possesses extraordinary special attacks like throwable detonation packs and a powerful running shoulder charge; weapons and tactics which help to keep the clones alive. Immediately after the Assault clone is introduced, the battle for survival begins. Wave after wave of deadly robots – each with varying attack and defense specialties – rush the clone’s base with the intent on destroying the player’s Moneyball: the ultimate jackpot in the Monday Night Combat world. When its shields are down and its life bar drained, the Moneyball explodes and the game is over. Therefore, players must keep close to this object and protect it at all costs by erecting upgradable defense turrets around the base, all paid for by funds acquired during combat. During the course of a game, players can gain positive jolts to their attacks and defenses by various means. Before the action starts and after every death, players have the opportunity to spend money on upgrading their skills to a max level of 3. Each upgrade level comes with a higher price, so players must prioritize which skills to improve and which are leave alone in favor of turret modifications. Secondly, clones accumulate “juice” after every kill and assist, which is collected and displayed in a power-up meter on the bottom of the screen. Once full, you can activate it by pressing both LB and RB at the same time. A flashing “juice” meter gives your clone a boost to their skills, speed and weapons for a short period of time. Bullets fly fast in Monday Night Combat . . . so watch out! Lastly, MNC’s mascot, Bullseye (the proverbial Santa Clause of the arena) offers players a slight diversion from the normal gameplay. Dressed in green and orange, if one takes the time to shoot him he’ll drop anything from money, juice or stat boots to temporarily use during the fight. But, also like Santa, he only comes but once a game (twice if the game lasts long enough). Once gamers fend off the attacking cybernetic army, the tutorial is over and they are officially welcomed into the Monday Night Combat “locker room” where the game truly begins. Players can either play “Blitz” in a solo or two player coop local battle, on X-Box Live with three other players or take on the ultimate challenge of “Crossfire”: a six on six squad-based battle where both teams have to defend their Moneyball while assaulting the opposition’s base and jackpot. In this mode, spawning bots act more like cannon fodder than actual bonafide threats, so teams working in tandem with their robot army and human counterparts will increase their chances of winning exponentially. Once you earn enough money in your personal stockpile by taking out enemies, chaining kills and fulfilling achievements, you can create your own soldier using the six established classes (Assault, Sniper, Assassin, Support, Gunner and Tank) as a foundation. However, it’s good to be mindful of their individual abilities while molding your warrior. A Gunner class brings stronger offensive capabilities to the table due to its powerful chain gun and devastating mortar launcher while, on the other hand, the Support class uses a more passive set of tactics like hacking into enemy turrets or throwing down a portable gun emplacement for cover fire, in order to protect himself from harm. 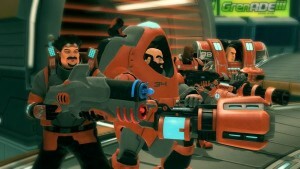 Monday Night Combat’s gameplay resembles your average third person shooter, but the flow of the game is nothing short of unique. Bullets fly by from all angles, Assassins sneak up, de-cloak and melee attack you out of nowhere and Snipers pick off players from long distances and hidden nooks scattered across the map. Even clones need some tender love and affection. The arena also sports “Ejectors” which, for the low price of fifty in-game dollars, send advancing robot armies to the scrap heap and human clones flying to their deaths into the pits surrounding the map. And then there’s the Annihilator. For 250 in-game dollars, this self-explanatory uber-hazard blasts the opposition’s forces from the heavens with devastating results. When it comes to Monday Night Combat’s overall presentation, it’s obvious that Uber Entertainment thought outside of the box. Elements like infinite ammo for all weapons, intricately rendered animations, a snarky play-by-play announcer and clones with their own individual personalities elevates this game from typical Unreal-engine powered shooters and transports this genre to another level of complexity and vividness. One of drawbacks with Monday Night Combat, however, rests in its most appealing asset: it’s content. While both engaging and fun, the depth of MNC’s gameplay options is ultimately shallow and superficial. At most, the game purports a handful of maps and two game modes, drastically reducing the replay value and ability to keep gamers from returning to other shooters like Halo 3 or Modern Warfare 2. Perhaps more content is on the way through future DLC, but 1200 Microsoft Points compared to what’s available right in-game now is a tough pill to swallow for the thrifty gamers already riding the digital fence. Also, getting into a match online can be very difficult at times. Long waits between battles, the inability to retrieve new hosts after one leaves the lobby and the occasional long map load times mire and tarnish an otherwise stellar gaming experience from the creative minds at Uber. Nevertheless, Monday Night Combat is the popcorn movie of video games; namely, an action packed diversion from the norm, a roller-coaster ride with just enough backstory and an overload of eye candy to appease any gamer, young and old alike.